Thank you for joining us in bidding farewell to Minister Chen Xiaodong and welcoming Minister Qin Gang. Minister Chen has been a close colleague and good friend of mine for many years. Nine years ago, we worked together at the Chinese Embassy in Egypt. We are more than pleased to be colleagues again in London, though this time only for six months. I must say I have nothing but thanks to him for the dedication and competence he has shown in performing his duties. 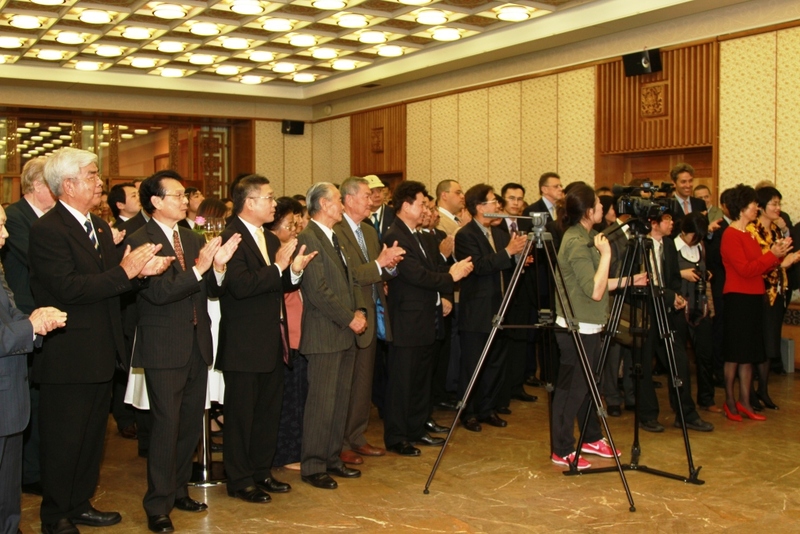 For years, I have been impressed by the "five good qualities" of Minister Chen. Firstly, he is a good colleague. He has been a source of advice and support to me. Since I arrived in London, I have benefitted a great deal from his broad understanding of Britain and solid grasp of China-UK relations. Secondly, he is a good team leader well-liked and respected by colleagues. He has done an excellent job in smoothly coordinating the work of more than 100 diplomats across a dozen sections within the embassy. Thirdly, he is a good diplomat. His modesty, professionalism and ability to communicate has won him many friends in Britain. In a little while Mr Stephen Perry, Chairman of the 48 Group Club, will present him with the Icebreaker Award, recognising his achievements during his posting in London. Lastly, but definitely not least, he is a good husband and a good father, though he has often been too busy to leave much time for his family. For that I must say sorry to his wife Madame Zhang Bin. I am sincerely thankful to her and to their daughter Yisha for their consistent understanding and support to Minister Chen. And I also wish to take this opportunity to congratulate Yisha on being recently admitted to a prestigious university in London. Whilst I am sorry to say goodbye to such a good colleague, I am also proud that Minister Chen is leaving us to take on a position of important responsibilities. I wish him the best of luck in his new endeavours. 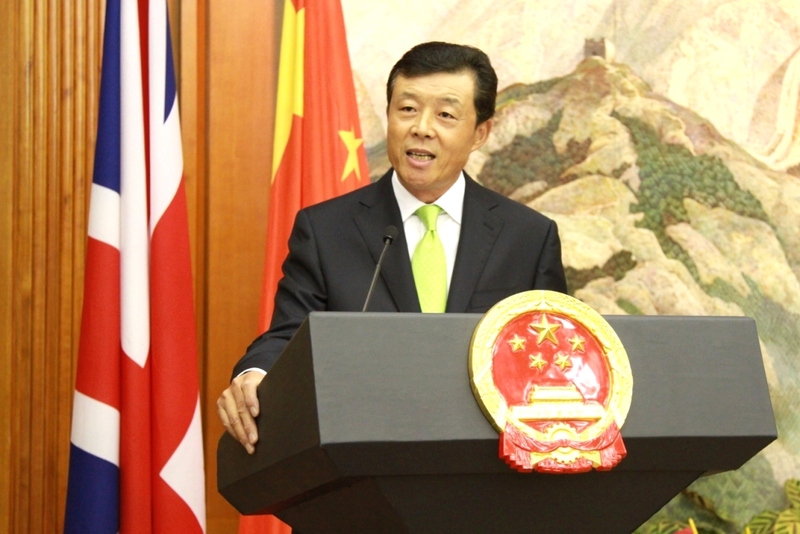 It now gives me great pleasure to introduce to you Minister Chen’s successor, Mr Qin Gang. Although I am sure many of you know, or know of him through his previous high-profile role as the Chinese Foreign Ministry spokesman. I hear that he has lots of fans in China. His association with the UK dates back many years. This is his third posting in London . Being an expert on UK affairs, he has brought with him his knowledge, insight and experience of Britain and of its people. I am sure he will do a good job as Deputy Head of Mission. I wish him every success and greater contribution to China-UK relations. Today China-UK relations stand at a new starting point and are blessed with new opportunities. We are ready to work with British colleagues to grasp these opportunities to expand exchanges and cooperation and take our strategic partnership to a new level. To conclude, I wish to thank all of you once again for your support and assistance to Minister Chen. I do hope that Minister Qin can continue to enjoy your support and cooperation.